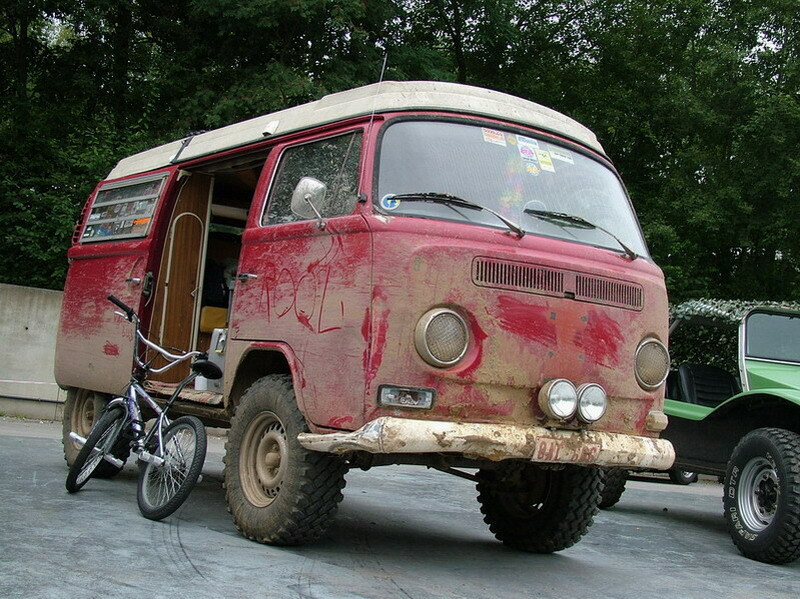 I have a 71' bus and was wondering if anyone had done any mods to their buses for off roading. and i have 14s on my bus.. does any one know any good dirt tires that fit on a 14? I get by with a little help form my friends. I know i cant spell. I think the bus is amazing as is for offroading! Although that said, I've put knobby tires on the 14 rims, just because I do take the old boy onto fire trails and two-tracks in the mountains around Colorado quite a bit. But the stock ground clearance, the stock torque (especially with SMALLER tires), and the rear-engine/rear-drive setup give the bus the chops to keep up with most of your friends' jeeps or other SUVs. And they won't be able to pop the top and cook dinner after they get where they're going, either. But you know that already! As for tires, I think the perfect bus tire that won't rub, or reduce torque too much, and fit on 14s is NLA, the BFG All Terrains. There might be a couple out there somewhere in a warehouse, but as for all of the online discount tire places, don't bother--I've been through them all, and even when they say they have some online, you'll get an email saying oops later. Richard Atwell's site is also a great resource, not just for tires, but for everything bus. 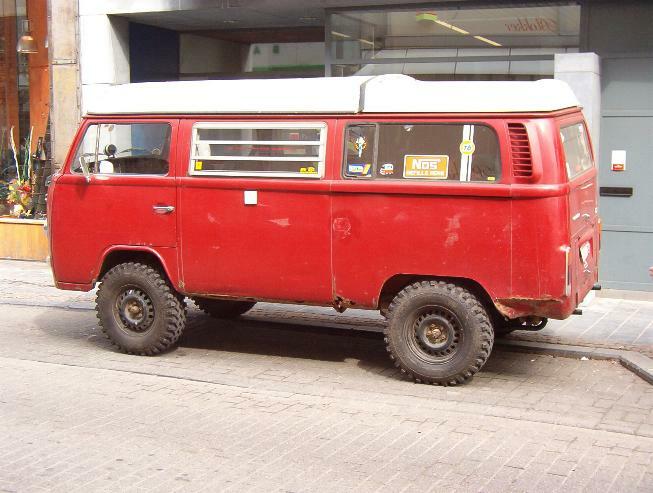 I'm going to put on 195R14 the Hankooks and hoping the slightly larger helps the bus in off road conditions. But I just want to find some off the charts camping spots. Been on the samba so long I remember petting that dog to see VWs, WYHI, and green bug girl. For offroad mods, I would start with tires as well. I have a set of the BF Goodriches. Since they are no longer available, I will probably try the Cooper SRM II's. 195/r14. They are a true D rated tire and are almost as tall as my BF's. I think wyomingriviera is running a set and they look good. Good Luck. I'm going to be using my bus in less the perfect conditions once its completed. Dirt roads, snow, sand, etc. I asked the off road tire question also.... heres the link to the thread. I also have a set of the BFG All Terrains and they have been excellent. Otherwise make sure that everything in your suspension is in top condition. Strong shocks are a must including the steering stabilizer… Finally if you do have a case of rear bus sag now is the time to fix it. ’79 Cali Westy 2.0 F.I. Good advice. Right now my bus is stripped on the inside except for the front seats/dash. Would it be smart to watch the weight of the bus if its going to be seeing a lot of off road driving? Sure, the more weight the harder it is on your bus however really you still want to have all the gear in the bus that you need in order to enjoy it (camping gear, etc...) so find the balance between offroad and overall fun factor. I have a 71' bus and was wondering if anyone had done any mods to their buses for off roading. 2L, Raby cam, HAM Heads, Mallory, Dual Dell 40's, Porsche discs, Fuchs (Colored matched not to my bus),tunin' the crap out of it, slammed on Wagenswest suspension. I like to take care of my engine and find a nice speed to cruise in on my bus, but sometimes.....you just get in the mood to run the piece of crap into the ground. I'm going with slightly larger tires, Vredestein Comtrac 205/82R14. Raises the bus about an inch and has a nice wide footprint. I just fell in love again..... with that bus. Thats what i want mine to look like! but thanks to everyone for your ideas. thats pretty much what ive been thinking about doing to mine, the tires and lights, roof rack will come when i get the funds. im just glad to see other off road bus people cuz everyone thinks im crazy when i tell people i go on trails with it. haha they have no faith till they see me, it may go a little slower but slow and stedy wins the race. Also, does anyone know where to get the gravel guards that are on the headlights of that bus?? I have been looking for those too. Don't call it a van.